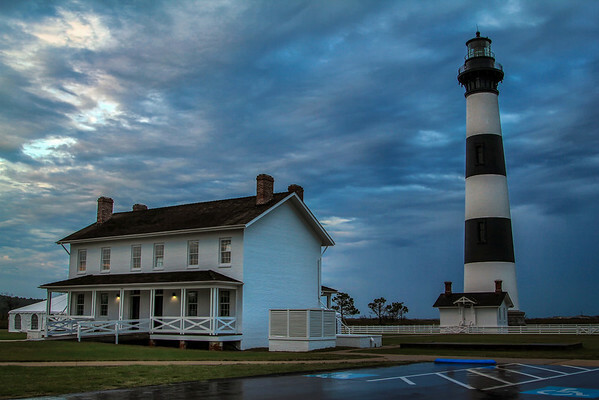 The Bodie Island Lighthouse, (pronounced "Body") is located just south of the town of Nags Head and Whalebone Junction, where Highway 158, Highway 64, and NC Highway 12 intersect. Visitors travelling towards Hatteras Island can't help but notice the black and white horizontal striped structure, peaking out over a line of dense cedar trees on the sound side. There are 214 steps to the top. The 156' ft. lighthouse still shines a beam 19 miles offshore, making full rotations at 27.5 seconds.